I always find cooking vegan cakes a challenge as I am rather wedded to my butter and eggs and now yogurt. I was surprised to find, however, that I enjoyed the vegan cake I made last year for my annual birthday cake ritual at work. Good as it was though, I didn’t feel I could bake the same cake again this year. Having been inspired by Brownieville Girl’s courgette cupcakes and given that we are getting masses of said items down at the plot, courgettes were an obvious choice as principal ingredient. I created a hybrid using the sponge from the black bottom cupcakes I made earlier in the year. A few other tweaks such as substituting ground almonds for some of the flour, adding cinnamon and varying the quantities made it into something completely different of course. These turned out slightly more puddingy than cakey, but were nonetheless very good. They were certainly appreciated by more than just my vegan colleague at work. No-one guessed that there were courgettes in the cake, though I suspect that they had a hand in giving the cake its moist (or was that stodgy?) quality. I’ve made a chocolate and date syrup topping before to good effect. Despite replacing the butter with water this time around, I was pleased with how well it worked and will be using this again. Damp pudding type cakes which are tasty but not too sweet. It's hard to detect the courgette unless you know it's there. Make a well in the centre and add the oil vinegar and water. Bake at 180 for 20 minutes, then turn out onto a rack to cool. Melt the chocolate with the date syrup and water in a pan over very low heat. Stir, leave to cool slightly and spread over the cupcakes. every year I intend to experiment with courgette cake, but never quite get round to it and the chickens end up with the surplus, so this could be the year i try a new recipe, it sounds delicious. always good to be challenged. I’d be up for this one I think. I love courgettes, stick it with chocolate…well hello! Great to have vegan/allergy friendly recipes up my sleeve. I recently made a beetroot and chocolate cake, which I think was a little more pudding-y as well as opposed to cake-y. I need to try courgette in cakes – I love carrot cake, but after my brussell sprout need to rebuild my confidence in baking with veg! Did you take the skin off the courgettes? (and if you didn’t aren’t there big bits of courgette in the cake?). Did you grate them finely? Any chance of a pic of the middles? – I’m a bit fascinated by these and courgette seems such a strange thing to be making cakes with. That, and having loads of them myself. Celia – made a really good courgette cake a couple of years ago but no chocolate involved. If I can lay my hands on the recipe, might try a chocolate version of that one. Hadn’t realised these would be a favourite chicken food – now worried and dare not boast of our great courgette crops for fear of neighbours’ chickens devouring the lot. Chele – you are the master cupcake baker so more than happy to have you on board. CGF – always worth having a go with surplus veg – surely, though it wouldn’t be good to deprive your chickens completely by the sound of what Celia says. Jac – I liked them, but I know some prefer their cake to be light and airy – these weren’t. The Intolerant Chef – yes, I’m glad I had to try some vegan baking, it is always useful and I do have friends who prefer not to eat dairy. Made2Order – True, especially when it’s self-imposed. CityHippy – But did you like your beetroot cake? Mine seemed to be quite popular – I think people like things that are a little unusual. Sushma – life would not be as interesting without cake. CC – Courgettes are good as they add moistness but no overpowering flavour. VBB – no I didn’t peel them. I quite liked the green flecks in the cake. Nor did I grate them that finely either. They do pretty much disappear into the cake as it’s cooking though so no obvious chunks. No pics I’m afraid, but these were rather dense. I’ve made a really nice courgette cake without chocolate in the past and need to see if I can find the recipe again, then I’ll try a chocolate version of that I think. Catherine – It’s good to know you can get one of your five a day by eating cake! keep seeing courgettes in cup cakes… but are they too un traditional for the Aby Village Show? What might the little old dears think? 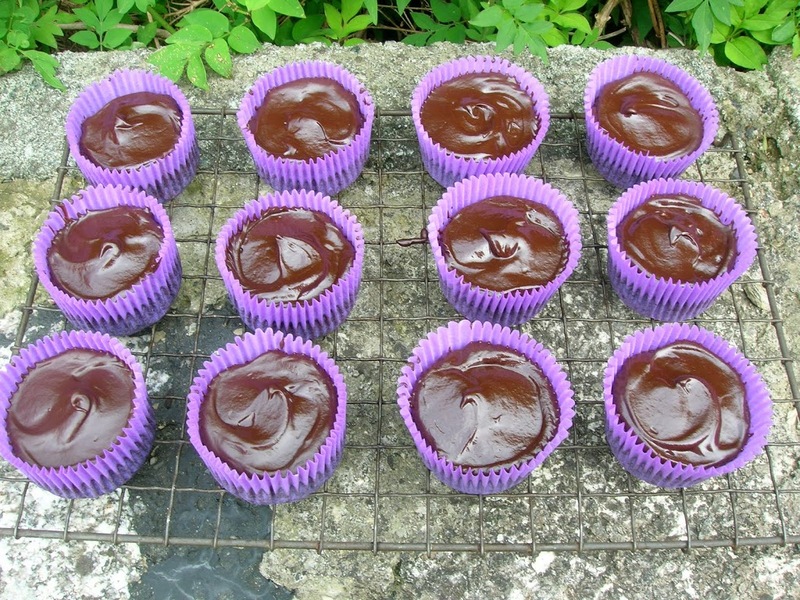 I remember making beetroot and chocolate muffins last year and they worked well using vegetable oil instead of butter. Johanna – thank you, they tasted good, the butter and eggs thing is mostly in my mind I think. Ananda – courgettes and walnuts sound good. Dom – go on test their reserve with a some courgette – I’m sure they’ll love something a little different really. Thank you Nic – not so much using the oil but the lack of eggs that worries me. Make Chocolates – Thank you. If only you had an outlet a little nearer I would definitely be attending one of your truffle and tempering sessions. I love the way you play around with recipes, you are very inspiring. These sound very lovely and I hope your vegan friend was pleased with them. I like the chocolate and date syrup topping too. Thanks Kath, very nice of you to say so. Luckily, they were much appreciated and I have to say the date and chocolate topping works really well. Great minds think alike.Check your e mails.I had already sent you a courgette chocolate cake recipe a week ago, before you made these. (I have always said I am a witch). Oh Lesley, thank you for the reminder. I did clock your recipe and will be making it soon – our courgettes keep on producing and producing …. Have you seen Great British Bake-In on the iPlayer? It was a bit more emotional than I expected, but some interesting decorating even if the cake seemed secondary to some. Chocolate date syrup sounds like such a wonderful topping! Happy birthday! Oxslip – yes I couldn’t resist watching this and it wasn’t as bad as I thought it might have been. I certainly wasn’t expecting any emotion and would have liked to see everyone’s cakes, not just a selected few. And I was rather put out with the judges having a go at that gorgeously pink raspberry cream. 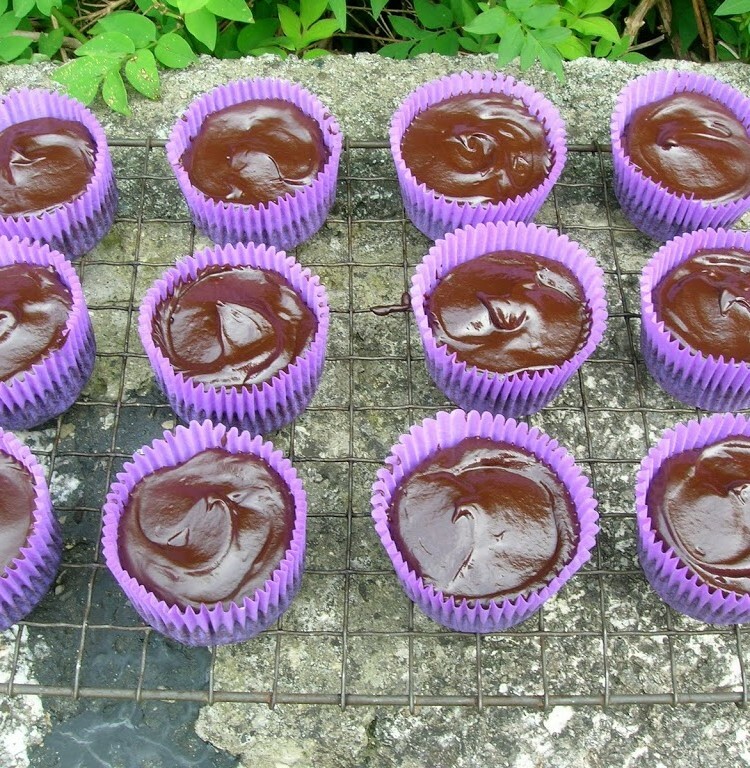 Thanks Foodycat – I shall be using that one again – very simple but works well – my ganache always seems to split!